Supplementary materials for teaching Issue 14 are listed below. Browse an interactive map of Issue 14. Watch 2017 Kingsley Tufts Poetry Award recipient Vievee Francis discuss the challenges of being a woman from Detroit living in the woods, the craft of writing poetry, and how poetry continues to thrive in the modern day (video from Claremont Graduate University). Then, read Francis’s poems “The Beauty of Boys Is” and “On Leaving the Mountains and Coming to the City I Thought I Left for Good” from Issue 13, as well as her June 2017 Poetry Feature. Bonus: read Francis’s interview with contributor Sebastian Matthews in our November 2017 Poetry Feature. Issue 14 contributors send word from near and far: Kirstin Allio’s dispatch from Providence, RI on motherhood and the noises of life; “The Hat,” Scott Laughlin’s dispatch from Budapest, Hungary; and Maria Terrone’s from the Colorado Rockies, Queens, Long Island City, Bannerman Island, and a New York railroad platform. Explore long-time contributor Maria Terrone’s poems, essays, and multimedia features, including Terrone’s poem “Ferdinandea” from our very first issue. Over at The New York Times, Samantha Hunt reviews Josephine Rowe’s A Loving Faithful Animal, and Michael Mazur’s life and work is profiled. Lashonda Katrice Barnett discusses her novel Jam! On the Vine with NPR’s Rachel Martin; read Interviews Editor Melody Nixon’s take in our Friday Reads column. Nicholas Friedman discusses finding poetry in everyday life and reads his poem, “Not the Song but After” on NPR’s Weekend Edition. Ten questions (and answers) with Kenan Orhan: on inspiration, writing habits, and places that inspire in The Massachusetts Review. John Freeman discusses finding, reading, and editing place-based literature around the world in an interview with literary magazine Words Without Borders. 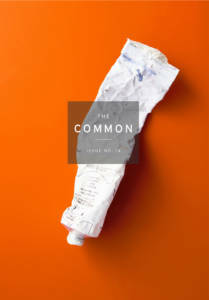 Kirstin Allio discuss motherhood, childhood memories, and society’s fascination with religious cults with The Common’s editorial assistant Isabel Meyers. “Flavored Graffito” and “Graffito’s Hinge” by Steve Barbaro, in a May 2017 Poetry Feature. Work by James Hoch, Alison Prine, and Mariam Willliams in an April 2017 Poetry Feature; see also: more from James Hoch in our April 2015 Poetry Feature. “Exuscitatio,” “Natural Selection,” and “Velda the Seer” by Daniel Lawless, in a March 2017 Poetry Feature. Work by Daniel Tobin in Issue 02 and Issue 08, as well as in our February 2017 Poetry Feature; get to know Daniel Tobin over at Mass Poetry. Work by Nicholas Friedman and Matt Salyer, in a January 2017 Poetry Feature. “Impressions” by Mik Awake, in a December 2016 Poetry Feature. “Bear Safety,” “About the Author,” and “The Power of Authority” by Loren Goodman, in a September 2016 Poetry Feature. “Mimic” and “(From) Fugue in Ten Movements” by Colin Channer, in a June 2015 Poetry Feature. “Legend” by John Freeman in Issue 10; see also: “English Hours” in our March 2015 Poetry Feature. “Apple” and “Kraft” by L.S. Klatt in Issue 06; see also: November 2014 and December 2016 poetry features. “Original Sin,” The Mortality of Books,” and The Major Subjects” by Lawrence Raab in Issue 05.